Everybody knows the theme of "misfits coming together to create family" is important to Joss Whedon — so it should come as no surprise that Agents of SHIELD, his new show, is heading in that direction. 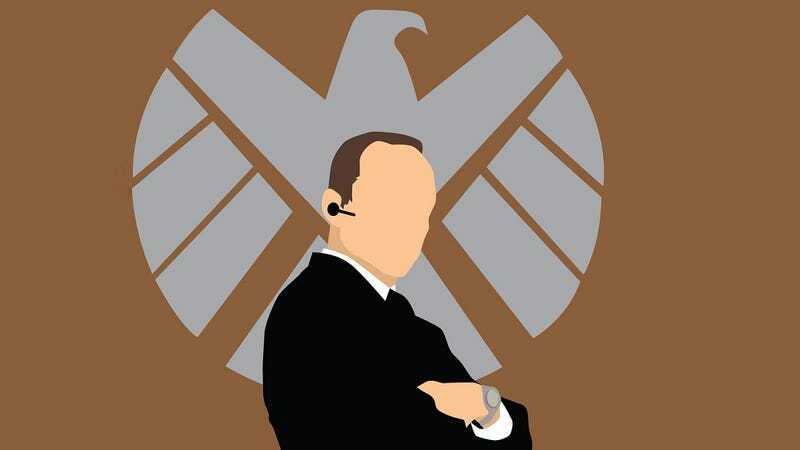 We talked to showrunner Jeffrey Bell, and he told us how we'll see more sides of Agent Coulson and his gang. Top image: nati-nio on Deviant Art. We were lucky enough to get an exclusive phone interview with Bell last week, and here's what he told us. You were the showrunner of Angel season 5, which was amazing. How is SHIELD going to be playing with those same kind of themes of "working for the Man?" Totally different, but equally poignant. But do you feel like you’re treading some of the same territory? With Wolfram Hart and SHIELD potentially both being evil? I hadn’t really thought of that. We don’t think that SHIELD’s evil. One of the things we've talked about with Joss a lot is this notion of how can we make Coulson's part of SHIELD [into the] good guys, in a world where the NSA and SHIELD are [spying on you], and we’ve listened to every phone call you’ve ever made and that’s how we catch the bad guy. Is there a way to handle those questions… and really we want to talk about those kind of questions in different ways so that we don’t glorify it straight ahead. Part of the reason to bring Skye in is to talk about, "Wait a minute, we do what?" And to look under the hood of how that happens and look at the consequences of doing that. Sometimes it's cool, because it helps us catch bad guy and other times its scary. So we want to play both sides of it. One of the things we’re doing with Coulson, specifically, is: Here’s a guy who’s always been a company man who’s always toed the line. And then he died in the Avengers and he came back — and we know from the first episode that there are people within SHIELD who know that something else happened. And suddenly, we have a question of what happens to the company man when the company has been keeping secrets from him. [This secret, which], over the course of the season, comes out in stages is one of the ways we’re dealing with the question you’re asking about. Was there a version of this show that you were developing before some of the N.S.A. spying revelations and some of the extent of drone strikes became available and known to us? Did it change as we learned more about that stuff? No, these were the things we were talking about before. Our little dwarf drones those are something that a lot of people [have commented on], and we thought those were a nice way for us to do a Marvel version of tech. But in terms of the more pressing Snowden questions, that just happened. It was a happy accident that we had to lean in to, because... it makes the show [more] interesting for us to talk about. So that fact that it’s out there suits everyone. One of the great things about last week's episode, which you wrote, is that there’s somebody out there whose maybe as clever as our guys and maybe as big of an organization. Are we starting to get hints of that with the scorpion-arms and other stuff that there is a Big Bad out there that we’re going to be dealing with? Interesting question. I will say this: We’re enjoying telling stand alone episodes that people can come in to watch and enjoy. But we also feel like we’re smart enough to be laying other information in that if people are paying attention, I believe, point in a particular direction, and so if you watch this weeks episode, there will be pieces from other episodes that we’ll be touch on that show how maybe some of these standalones are connected. There's something else happening. There seemed to be a kind of Alias vibe this past week, with the spying and counter spying and that kind of thing. Was that intentional? Maybe a little bit. I liked writing for [Alias] and I liked the energy of that show. There are overlaps like we’ve talked about this show is kind of a combination of… there’s kind of an X-Files element to it, with all of the weirdness that happens in the Marvel universe. There is an Alias aspect of it, with respect to SHIELD as a spy agency. [But] one of the things that we promised when we started making this show was that each episode would be a little different. One might be a spy show, one might be a superhero show, one might be a monster movie show. We want to show people all of the different colors of this world and tell a story that checks into Coulson’s past, so we can learn a little more about him. So this Amador character seemed to fit into that. And then you know, I just like a good kinetic cross cutting of three stories all coming together. And this story line provided that. Image by Saturn-Kitty on Deviant Art. And the line about Mom and Dad are fighting was really spot on. Is Melina May going to become more to the Mom to this family? Is she going to be more to an equal to Coulson going forward? One of the things that we’ve really enjoyed are there are some really great scenes between Coulson and May. Quiet moments where they come together, and where you see [that] Coulson relies on her experience or she can find something in him. So those play great. [They're] both experienced agents who have been thought a lot of stuff together [and] they have this history. I think you will see a lot of them together. You know, it’s Coulson’s team and she’s a member of that team and she had a specific role. But I do think she’s someone he can turn to, to seek counsel, and she does the same. I really want to see Clark Gregg cry. When are we going to get to see Clark Gregg cry? That will be season 12 or 13. Or just show more vulnerability. He seems like he’s always really on top of things. Going back to what I said earlier about we all know there is a secret about Coulson that we set up in the pilot and as that goes forward I think there’s enough there for him to play a lot of different notes. Were you prepared for so many people to dislike the characters of Skye and Grant in particular? First off, I really make it a point to not over read stuff [online]. Honestly. And I don’t understand why people don’t like people. I find them both interesting, and every episode more so. Honestly I don’t really get into that. We love our actors, and we love the characters they play and we’re going to write them to the best of our ability whether people like them or not. Sometimes you do a character so that you won’t like them, on purpose — but I think they’re all interesting, emotionally complicated and good at their job. and I think that people are going to love all of them in their different ways. A lot of people have been comparing SHIELD to Torchwood and Warehouse 13. Was that something you guys thought about, with either of those shows, when you were getting started? Oh, no. Jed [Whedon], Joss, and Marisa, they had these characters, [and] these characters kind of came forward. The idea that Coulson puts together this team, and they fly around on a plane was sort of the beginning of it, and just setting up the Marvel universe — what the realities of that look like on television schedule budget — [could] be cool. I don’t think they were looking to Torchwood or Warehouse or any other show. They were trying to make a story that was interesting to them. And you know because you’ve got all of the Joss... the theme of people coming together to create family seems to always be there. One of the things that you hinted at just now was that there might be some more conflict with Big SHIELD over them keeping secrets from Coulson, and possibly having a conflict with his superiors. Do you have to worry about stepping on what might be happening in some of the upcoming movies like Captain America 2, with regards to SHIELD? When we started this series, we met with Marvel. We talked to them about what our plans were, and they talked to us about what their plans are — because we do exist in the same universe. And so there is a coordination and awareness of what one another are doing. In terms of the thematic thing you're talking about I think that's more an issue of the times we live in. The same way that there seems to be a zillion post-apocalyptic stories out there. There’s the movies, or the TV shows, with Revolution or the Walking Dead. There's this notion with this post-apocalyptic people are on the run struggling to survive that struck a nerve with a lot of people. So I think along the same line, there’s a certain paranoia with a government that can’t cooperate. There’s a government that’s shutting down because they don’t agree. I think any time you have a large institution whether it’s SHIELD. or the C.I.A. or the F.B.I.. It was weird to write Alias and go, "Hey, the C.I.A., we’re the heroes." It’s weird. And so we tried not to do that, but to say "Sydney Bristow is a hero and she does this stuff." Sometimes, she was in conflict with the agents she was with and other times not. Its not so much that we’re trying to say that SHIELD. is good or bad but I think when you have a giant corporation that has the kind of power and secrecy that it does, there’s opportunities to tell all types of stories. And the thing about us being our little small "bus group" is we can be the warm friendly version of that when we need to be. But if we need to call in the big guns, because something truly terrible happens, we have them in our back pocket. The show's mission statement, when it started, was that the secrets out now after New York and the battle of the Avengers. Everyone knows about aliens and gods and stuff. Is trying to keep all of that stuff secret just putting your fingers into a dam that’s already bursting in like 10 other places basically? Is it ultimately a doomed mission trying to keep a lid of that? A lot of the things that SHIELD. would have kept secret about [are now public]. We made a comment in the last episode that aired [that] between Instagram and Facebook and Flickr, people are surveiling themselves. But at the same time, it's hard to cover up a superhero like Mike Peterson in the pilot, because all of these people have cell phones and are taking video of him. So we’re trying to acknowledge that the world has changed around SHIELD. as well and a lot of the stuff that they used to be able to cover up is harder to do now that everyone has this technology. Which is cool in a democratic way that all information is democratized. And that’s mostly good — but then we’re also going to get into stories where we ask the question, because we have people on our team who are different levels [of clearance]. Skye is not a level agent at all and Coulson is higher than everyone else. What happens when a secret or a piece of data comes on the plane that only Coulson has access to how does that fracture the team when not everyone’s equal like they’ve been in the other episodes. Skye’s never experienced that. That that’s a kind of fun story.